Evening Star Brand Vintage Lemon Crate Label, Fernando Heights Lemon Assn., San Fernando, California. 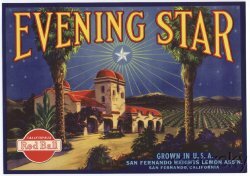 "California Red Ball"
Evening Star Brand Vintage Lemon Crate Label. Original label from San Fernando Heights Lemon Assn., San Fernando, California. "California Red Ball." This mint label from the 1940s measures 8.75x12.25 inches. Image of a Mission at night, with a star above.